Now that Square is publicly available for iPhone and Android OS, with millions of card readers being shipped free of charge, Jack Dorsey tells Fast Company how his business model will disrupt the way you pay. Starting today, Square aims to make credit card sales as easy for retailers with an iPhone as it is for some dude selling a couch on Craigslist. With Square, anyone can accept credit or debit card payments by downloading the app and plugging a little plastic cube into the headphone jack of an iPhone, iPod Touch, iPad, or Android phone. After a quick swipe of the card through the reader, the merchant turns the device over to the customer to sign his or her name on the touchscreen using a finger instead of a pen. The customer can add a tip, either by percentage or a particular amount, and then enters their phone number or email address. In the best case, the receipt message will buzz in the customer’s pocket as an email or SMS text message while walking away with their purchase. Customers are charged as usual by their banks or credit card companies, and Square settles up the net funds with merchants each night instead of at the end of the month. The swiper and application are both free and include access to an online dashboard with analytics that help merchants track exactly what they’ve been selling. “With Square the goal is to get people in immediately, and make the transaction as smooth and simple as possible,” says Jack Dorsey, the brains behind Square and the cofounder and chairman of Twitter. About 1,000 users are currently using the Square card swipers as part of a pilot program, and Dorsey expects to have distributed several million more within three months (a cash-only iPad version is already out). The band Spoon has been using it to sell merchandise on the road, and Dorsey says management and record companies have asked him when it’s available. The charity Tipping Point used 25 iPod Touches to take donations by going table-to-table at a fundraising event (multiple devices can be logged into one account). Square was borne out of necessity, and far from Wall Street, with a St. Louis glass blower named James McKelvey. He hand crafts high-end faucets and fittings–the sort of thing that someone could fall in love with, but doesn’t really need. And when he makes a sale, it’s usually a spur of the moment buy. Trouble is, he only accepts cash at his studio, and if someone only has a credit card the sale is lost and unlikely to return. “So we took a month and we built a prototype,” Dorsey says. The cofounders showed it at the Allen & Company conference in 2009, and received backing from Khosla Ventures not long after. To understand the disruption that could be caused by Square, it helps to understand how convoluted the credit card system is now. Most merchants accept credit cards after being approached by an independent sales organization that offers to set up the process in exchange for a monthly fee, plus a gateway fee, and the cost of a card reader. After that, the card company takes a percentage of every transaction. The lowest rate offered is around 1.79%, but the rate is variable and for reward cards it can run as high as 4% of every sale (it’s not the credit card companies that are paying for your free flights, it’s the merchants who foot that bill in the end). These fees are deducted from the merchant’s account at the end of the month along with any charge backs when someone refutes a sale. This makes it difficult for small and medium businesses to accurately gauge their cash flow from month to month. Maybe that’s why, according to a report by the Federal Reserve Bank of Philadelphia, of the 30 million businesses in the U.S. with under $100k in revenue, only 6 million accept credit cards. Enter Square with a more transparent alternative. The fee charged for each transaction is 2.75% plus 15 cents. Not the lowest available, but it’s a reliable fee regardless of the type of card used. And Dorsey says that Square accepts most every variety of U.S. plastic, and can even be used with cash. The card reader device is an inexpensive piece of electronics–it’s not industrial strength, but it does the job and there are alternatives for businesses that need it; Square has already partnered with the makers of the card reader used in Apple stores, which is both sturdier and powered by its own battery. Square’s nearly instant transactions offers an added security benefit for customers as well: They’ll be notified immediately about any unauthorized use of their card or numbers should anyone run it through Square. Customers can add yet another layer of security by visiting the Square site. Along with seeing receipts, there is the ability to associate a photo with the account that will appear on screen with every swipe. 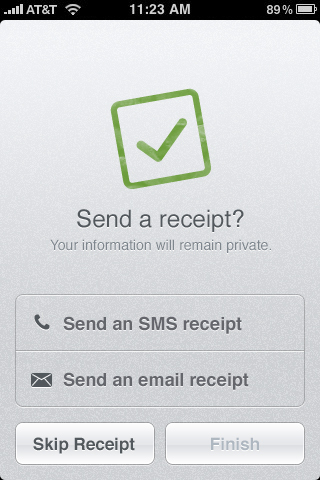 Square shares very little about you with the merchant, and doesn’t even keep your credit card number on file. Although a phone number or email address is needed for the transaction, that is not shared with the merchant, only with Square. And the credit card data is encrypted and passed directly to the card company. “We don’t store any card information whatsoever,” Dorsey says. At the same time, Square gives the merchant just enough to recognize repeat customers and offer them incentives. In the dashboard, a merchant can customize a notifier for, say, every tenth visit by the same customer or any time a customer spends more than $100. This notification will appear on screen after the swipe and allow the merchant to offer a discount or giveaway. to own the patent on the technology behind the card reader. And there are plenty of other attempts underway to upend the credit card industry, either through direct mobile payment, such as Obopay, or by improving the way credit cards already work, with social finance sites like Swipely. And Intuit already offers GoPayment, which enables mobile phone credit card payments for a $12.95 monthly service fee, and optional card swipe hardware for between $145 and $219. There are likely to be other competitors as well, since this market is so ripe for change. 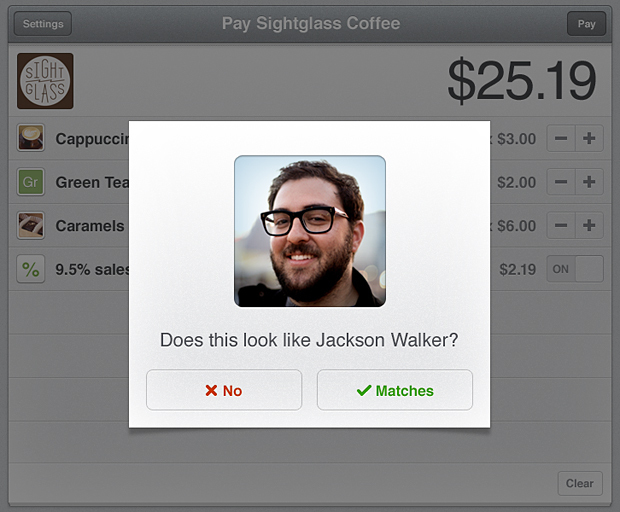 But none of the current offerings are as simple, or offer as much extra value to merchants, as Square.